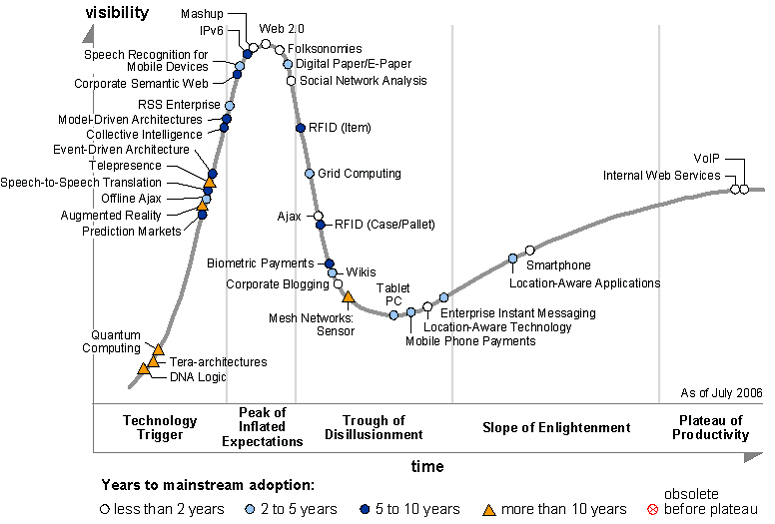 In reply to Mark Palmer’s rebuttal, What Does it Mean to be Mature?, the figure below illustrates the popular Gartner Hype Cycle. You can click on the illustration to get a clearer image. In context to the Gartner Hype Cycle, CEP is closer to the “Technology Trigger” phase than anywhere else in the hype cycle. CEP has not yet reached the “Peak of Inflated Expectations”, but is inching closer and closer. In addition, as a correlating reference point, if you look at a recent Gartner Hype Cycle that covers EDA, for example, you will find that EDA (Event Driven Architecture) is at a similar phase, the “Technology Trigger” phase. You are currently browsing the archives for the EDA category.